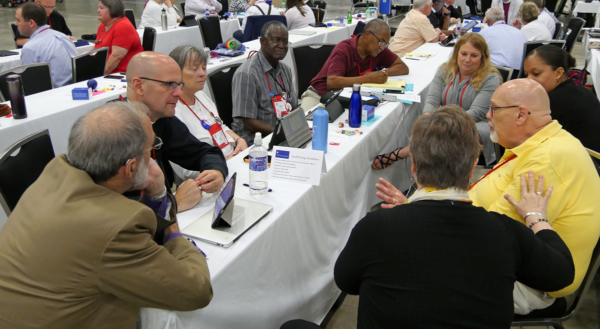 [Episcopal News Service – Austin, Texas] Among the unique offerings at this triennium’s General Convention are TEConversations (The Episcopal Church Conversations), which are being held during three joint sessions of the House of Bishops and the House of Deputies over the coming week. Each conversation offers multiple speakers, video presentations and engaging interludes around the three priorities of this gathering: racial reconciliation, evangelism and care of creation. 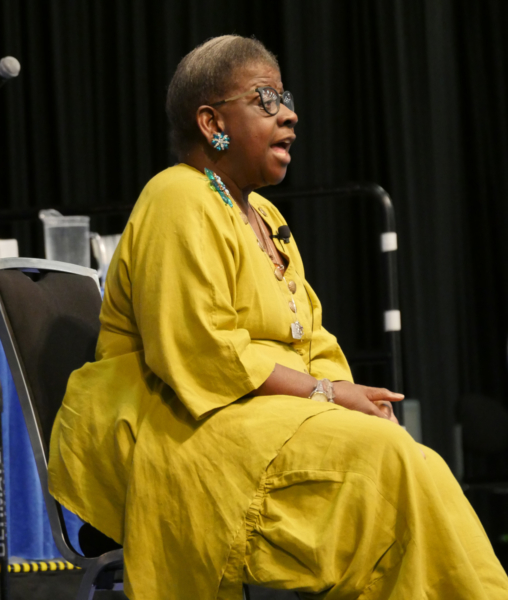 Speakers represent international leaders, well-known Episcopalians, and rising voices in the church. The first of these, A Conversation on Racial Reconciliation, opened at 10:30 a.m. July 6. “This day is designed for you. This day is for everyone to learn and be included. A day of listening. A morning of conversation. A day of learning. As you listen to the speakers, remember that everyone matters,” said the Rev. David Crabtree of North Carolina, moderator of the July 6 conversation. Speakers for the first TEConversation took a deep and personal look at racial reconciliation. A reformed former leader of a worldwide racist skinhead organization, Arno Michaelis kicked off the presentations. “Hate ruled my life,” he said. As the former leader of the largest racist skinhead organization in the world for seven years, Michaelis spoke of hate and violence as an all-consuming a way of life. Meeting Pardeep Kaleka, the eldest son of Satwant Singh Kaleka – president of the Sikh Temple of Wisconsin who was gunned down during the attacks of Aug. 5, 2012 – changed Michaelis’ life. Together, they started Serve to Unite in response to the attack. Through this organization, they “wage peace” and invite others to join them. Channeling peace, love and especially the “double-edged sword of forgiveness and compassion,” Michaelis also works to get people out of organizations like the KKK. He told the story of “saving” a father and son from that life through this practice of nonviolence. A former imperial grand wizard of the Georgia Klan also burned his robes and left that life. “Hate and violence can be stopped by forgiveness and compassion,” Michaelis said, adding that if he had been violent in response to their anger, they would likely still be in the KKK. 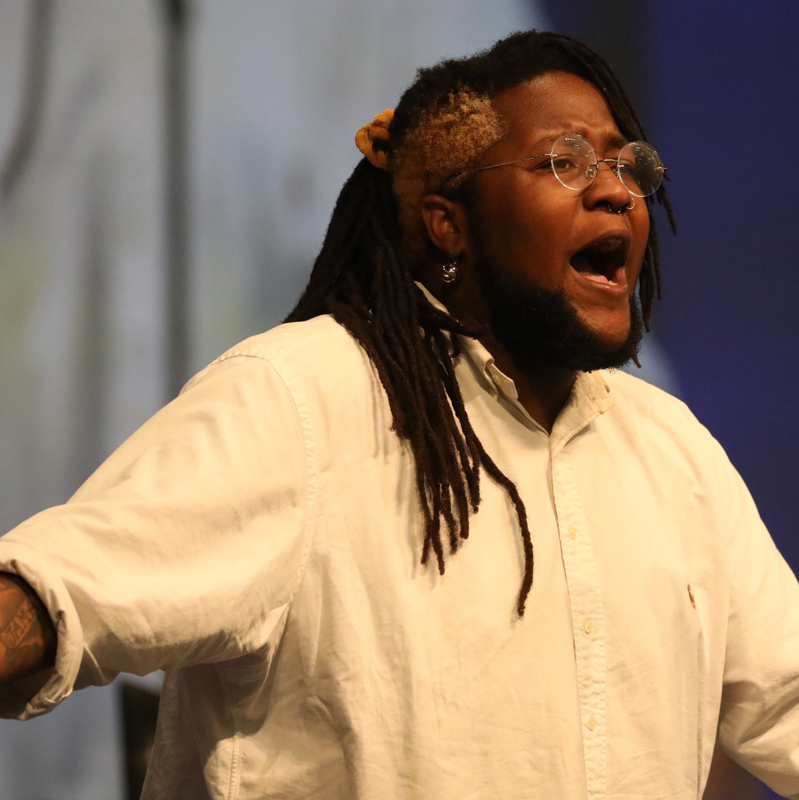 The scheduled speakers were punctuated by a special guest: Local Austin poet, Charles Dawain Stephens, aka Chucky Black, recited his poem “Black Magic” about the goodness and magic he sees in his people that help him through the dark times. The Rev. 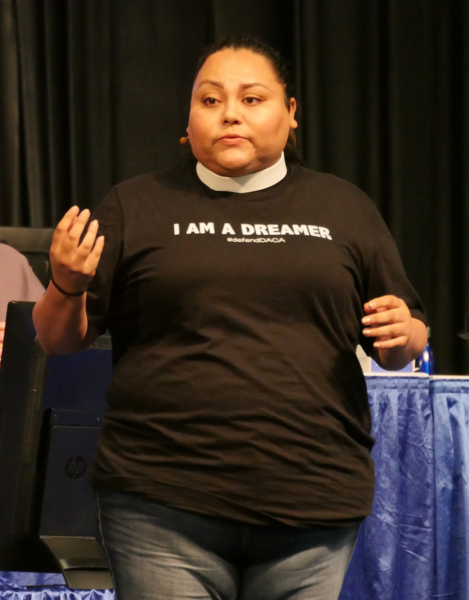 Nancy Frausto, an Episcopal priest who is a native of Zacatecas, Mexico, a and DACA (Deferred Action for Childhood Arrivals) beneficiary, was the morning’s final speaker. Frausto is a “Dreamer,” “which means I entered the country illegally. I ran … and hid … to be reunited with my father,” she explained. She was 7 years old when she came to this country, and a beloved community is something she desperately wants. “Imagine working toward a beloved community. You have to work toward racial reconciliation. To get there you have to talk about truth,” she said. It is about the entire system, according to Frausto. If we truly care about the “Dreamers,” then we must care about the parents – the original dreamers, and the children in the camps today, and the black boys and girls in the neighborhoods, and all those who are marginalized. During that time, people first sat in pairs, and then in groups. These were generally made up of the bishops and deputies of one or two dioceses. An Episcopal Church staff member noted that some groups included their alternates in the discussion, although rules about who can be on the floor at a given time made this tricky. As the deputies and bishops left the floor of the House of Deputies, they shared their reactions from the first TEConversation. Bishop Greg Brewer, also of Central Florida, was energized by the session. “I welcome it. These conversations are absolutely necessary if we are going to go from racial enclaves to reflecting the multiracial Jesus Movement that the presiding bishop envisions.” He added that he appreciated the diversity of the presentation, “from hip-hop to Dr. Meeks sitting down and talking to us.” And, he said that he looks forward to the next conversation. Each TEConversation will be available live so people can participate concurrently with deputies and bishops. Each will also be available online, with support materials, for local use in churches at a later date. Participants can also text 51555 to share resources, ask questions and continue the conversation. On social media, #belovedcommunity, #jesusmovement and #gc79 can be used to share thoughts and ideas. The next TEConversation is on evangelism and will be held 2:30-4 p.m. CDT on July 7. – Sharon Tillman is a freelance writer and a member of the ENS General Convention reporting team. May we assume in the postmodern world that race, gender, and politics have now replaced the life, death, and resurrection, and the return of Jesus Christ? Does The Episcopal Church leaders no longer consider itself Christian? I do not think the major topics of this convention are really issues in these nation. I retract the above statement. If the work is done in Jesus name than it may be a cup of water to one who is thirsty. In response to your query: I do believe that all of these topics are Christ centered on Jesus’ resurrection and Godpel message. Are we to just wait for his coming and speak of his death. Jesus walked among people such as those who were marginalized and fought for justice and salvation for all. His Gospel message continues. No. While you “assume” things, that doesn’t mean the rest of us thing as you do. However, as an African American and a Cherokee, these are of major importance and can be discussed given the racial climate (e.g. police officers killing unarmed African Americans, whites calling the police on African Americans living while black) and the political climate. This doesn’t preclude the centrality of Jesus and all issues can be discussed without negating other issues. As also a mixed race person with a Ph.D, I disagree with Dr. Cowherd. We must get past making things “racial,” and get back to basics of making Jesus, the main thing! If we do that, everything will fall into place. I think this is simple. As long as we do not treat others as Jesus would, topics like racism must be discussed as a Church. Otherwise, we are ignoring Jesus’ teachings. How do we follow Jesus if we don’t talk about how to change ourselves into people who are following Jesus? I would apply the same logic to all the topics of this Convention. I am having trouble finding any video links to this conversation/presentation at GC. Anyone have them?